Choose the XS Purifier if you want the simplest way to freshen and purify the air in any room up to 800sqft. Plug it in and turn it on and let it run all day long. Or use the timer to control the ozone cycles to your desired liking. Choose the Ultra Purifier if you want to purifiy an entire air duct system or if you need to treat humid spaces with ultra-violet, germicidal & ozone purification. Comes with a built-in timer that allows you multiple programming options. Choose the MaxBlaster Residential Edition if you want to perform DIY blast treatments on your own property or vehicle. Creates high levels of ozone gas in an effort to permanently blast odors in spaces that are unoccupied during treatment. 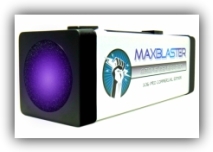 Choose the MaxBlaster PRO Edition if you need a commercial strength ozone blaster for business applications. Creates very high levels of ozone gas for use in unoccupied spaces. This workhorse machine is ideal for frequent use. 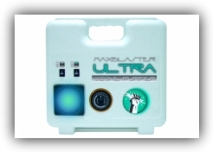 Choose the MaxBlaster PRO-G Edition if you want expert level ozone gas that stretches the boundaries of ozone production. Similar to a drag-strip race car this machine should be used only by those who will take good care of it and use it properly.